Radiation treatment seems very straightforward. Usually you start by having a special CT scan to map out the radiation. Some days later, after the radiation is designed, it's time to start. The radiation staff bring you into the radiation room (like the room on the left). They lie you on the table and position you. They leave the room, and then do some imaging to make sure you're in the right place. Then the beam turns on. You don't feel it. You get up and leave the room. ​The same thing repeats, usually for several days and weeks. ​Seems straightforward. But it's not. From the patient's perspective, radiation might seem very simple. But behind the scenes, there are dozens of tasks that need to be done correctly to make sure everything turns out as intended. To give you an idea of how complex modern radiation can be, the picture at right shows a simplified version of a radiation plan for a patient with a throat cancer. It's a CT scan. You can see the jaw very easily (the white horseshoe shaped bone near the top). 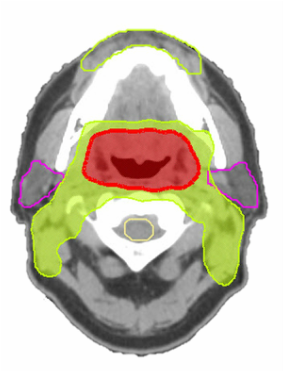 Behind the jaw in green and red are the medium and high doses of radiation. The high dose (red) treats where the cancer is known to be, and the medium dose (green) treats areas where the cancer might be. But you can also see the areas that are being avoided by the bulk of the radiation, including the lips (in green at the top), the saliva glands (in purple at the sides) and the spinal cord (the yellow circle further back). These are only a few of the important areas. For many head and neck cancer radiation plans, there are more than 20 different structures to try to avoid. How does the machine know where to put the radiation? It all depends on human input. The radiation doctor is ultimately responsible for outlining the areas to be treated and the normal tissues to be avoided. Part of this job is often delegated to other members of the team, and double-checked by the doctor. The computer only knows what's cancer and what's healthy tissue because of what is outlined. If an area of tumor is not outlined, the computer won't aim to treat it. And if a normal organ isn't outlined, the computer won't try to avoid it. After the outlining is done, a radiation planner (called a dosimetrist) designs a radiation plan based on those outlines. Properly-designed radiation plans are like nice paintings, with all the brush strokes in the right places. Top-quality radiation can be very effective. Improperly designed plans are a problem. They can lead to lower chances of cure, or higher chances of side-effects. Some of these issues have been highlighted in media reports, including a 2010 series in the New York Times. Even though radiation is complex, with the proper checks and audits in place, it can be made to be very safe. ​These safety checks are needed to catch any small (or large) mistakes that can occur during the radiation planning process. This includes double-checking the patient identification, the scan, the location and outlining of the tumor, the radiation design, patient positioning, and treatment machines. ​It's a long list. In other words, cancer centers should audit until they've got it. Fortunately, among top-notch centers, radiation safety is a major priority. Many of the big radiation associations also make safety a top issue, including the American, European, Canadian and Australia/New Zealand radiation oncology societies, which have task forces and recommendations. But even with the recommendations available, some radiation centers will be more committed than others, with more safety checks in place. As a patient, there's no way to double-check that each and every step is being done correctly. ​But there are a few key things to ask about. What should I ask my doctors about my radiation? 1. For my type of cancer, are you considered a high-volume radiation center, and a high-volume radiation oncologist? Just as we learned with surgery, volume is important. High volume radiation centers, and high-volume radiation doctors, can be better. ​2. Does your center meet the quality assurance requirements from the American Association of Physicists in Medicine and the American Society for Radiation Oncology? In countries outside the U.S., other similar guidelines might be used. 3. Will my radiation plan be double-checked by a second doctor? This double-checking is called 'peer review'. A second set of eyes can catch mistakes and lead to changes in treatment. It is recommended, but not all centers do it. 4. Who else double-checks my radiation plan after it's done? Additional checks by a medical physicist and a radiation therapist are important for helping to catch errors. Having every patient's plan double-checked by three people (or more) is a common approach. 5. How well am I being positioned? 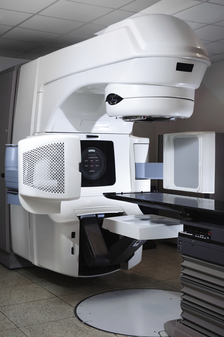 Before each daily radiation treatment, images should be taken to make sure the positioning is correct. Ask your doctor if they have reviewed the images, and if there are any concerns.